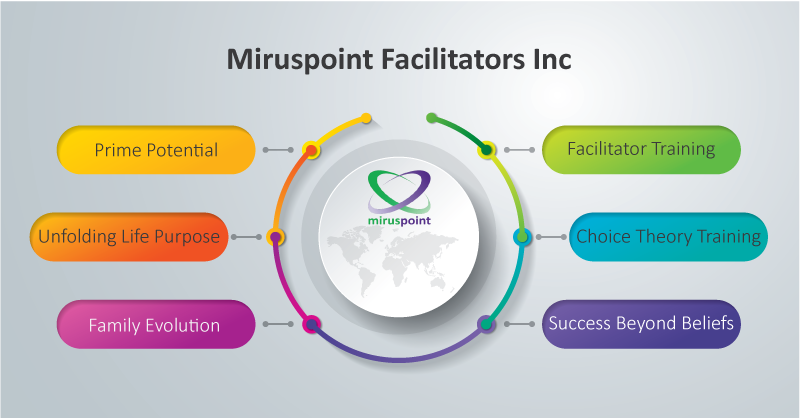 Miruspoint Facilitators Inc. is a Vancouver based company founded in 2005. The name was created to reflect what we really are about. “Mirus,” is the root word for miracles and the miraculous, and “point” refers to “Zero Point,” from quantum physics where everything is possible. This may sound pretty airy-fairy, but it really reflects our focus—helping people experience how amazing they can be when tapped into their own potential, and the potential of life all around them. Prime Potential is our flagship process, a one-on-one structured process that guides people into a profound shift in how they see themselves and show up in the world. Because this work encompasses the whole person—body, mind and spirit—amazing changes can occur on all levels. Clients have had their health shift dramatically, performance enhance ten fold, and found that peace and well-being can be present even in the midst of great change or chaos. Clients are attracted to this work from all walks of life with a huge range of issues. In addition to the one-on-one work, we offer a group process called Success Beyond Beliefs which gives participants an experience of the core change process of Prime Potential. It can be done within an organization or company that wants their whole team to move to another level of success and performance. Family Evolution and Unfolding Life Purpose are one-on-one processes that build on the foundation of Prime Potential. Exploring your life purpose from a place of confidence and open-heartedness is very exciting, and offers people a liberating view into their future. The Prime Potential Facilitator Training program offers professionals an opportunity to add the Prime Potential process to their skill set. It is a powerful training program that weaves theory and practice together, and gives Facilitators the skills they need to deliver the Prime Potential process to their clients. We’ve had wonderful feedback from professionals who love having this amazing process available for clients who want rapid, profound change. Miruspoint’s vision is to unleash every human being’s potential to live vibrant lives filled with joy, peace, and meaningful contribution. Training in Choice Theory, Reality Therapy and Lead Management is offered in collaboration with William Glasser International (WGI). This training offers professionals in education, mental health, addictions, corrections, and business a deep understanding of human behavior and how to create quality relationships both personally and professionally. Dr. Glasser promoted self-responsibility and non-coersive learning environments so that people in any setting are motivated and want to perform optimally. There are five levels of training in the Certification Program, starting with the Basic Intensive. It provides an introduction to Choice Theory, its application in Reality Therapy and in Lead Management. This is registered training and allows people to complete the Certification program if they so desire.